The FIRST, the ORIGINAL and still the BEST gun cleaning patch and solvent collection system on the market. Bore Tech's patented PATCH HOG™ simply slips over the muzzle of any firearm and eliminates the mess and odors associated with firearm cleaning. All your unwanted chemical splatter, offensive odors and dirty patches are captured in a reusable, plastic water/soft drink bottle. The PATCH HOG is Simple, Effective & Convenient. The first of its kind and still the best, Bore Tech’s Patented PATCH HOG™ is an innovative patch and solvent collection system featuring a unique and practical approach that eliminates the mess and odors associated with firearm cleaning. 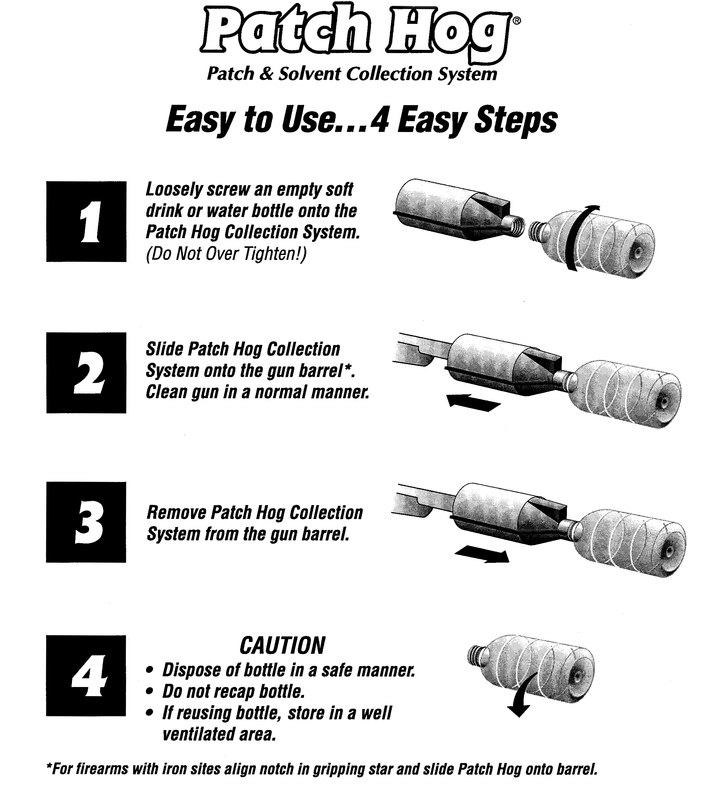 The PATCH HOG is the answer to unwanted chemical splatter, dirty, smelly trash cans and chasing used, windblown patches down range. The PATCH HOG simply slips over the muzzle of any firearm and securely fastens itself via a custom molded, non-scratching, thick rubber grommet. No awkward clamps, No breaking straps, No screws required. The PATCH HOG’S grommet will grip up to a 2 inch diameter barrel and even accommodate most iron sights. The top of the PATCH HOG has female threads and accepts most plastic water or soft drink bottles with full size, standard threads. Simply screw your bottle into the PATCH HOG and all of the offensive odors, solvent spray, and dirty patches will be contained when exiting the muzzle. No more stained tables, carpets or walls! Unlike other manufacturers’ products, the PATCH HOG does not require additional cleaning following use. After cleaning, simply unscrew the plastic bottle and dispose of it. TIP - If you want to inspect your patches while cleaning or reuse your bottle, simply cut a small window into your bottle for easy access. The Bore Tech PATCH HOG is a great gift and is sure to attract attention at the range! Q: Will the Patch Hog scratch the finish on my barrel? A: No, the custom molded, non-scratching, rubber grommet is specifically designed not to harm barrel finishes but still provide a positive grip. Q: I cannot find a bottle to fit the Patch Hog, what do I do? A: The Patch Hog will accommodate full size, standard bottle threads and will not work with most value brand water bottles. This device allows me to clean a rifle anywhere in my home or at work without having the soiled patches land on the table, desk, floor or anywhere but inside the bottle for easy containment and disposal. The Patch Hog also contains the spray off of a wet bore brush so there is no mist of the chemicals flying off into the air and landing everywhere. You can literally clean a rifle in your living room and contain the entire mess of the process in one bottle. You can also cut an access hole in the side of the bottle (so that it aligns on top when attached to the Patch Hog) for removal of the soiled patch from the jag for closer inspection. This patch trap is outstanding. No more strong solvent odors in the house. All the dirty patches are in the bottle, so you don't have to mess with them after cleaning. This product really minimizing the mess of rifle cleaning. If you use it at the range, you don't leave your dirty patches at the range or have to pick them up after cleaning. I use Sweets, which has a really strong odor. After using this product, my wife doesn't complain about me cleaning my guns in the house. For all the married folk out there, it helps keep peace in the household! I have used your Patch Hog for a long time now and it is wonderful! You guys really made it just perfect. Cuts down on mess and smell, no spilling, and easy clean-up. Plus it is very well made! Thanks.